This work was partially supported by NASA’s International Polar Year and Science of Terra and Aqua programs via the ASTER Science Team. We thank Bruce Raup for a constructive review and Jim Torson for helpful tips. ASTER data courtesy of NASA/GSFC/METI/Japan Space Systems, the U.S./Japan ASTER Science Team, and the GLIMS project. Arendt, A., Echelmeyer, K., Harrison, W., Lingle, C., Zirnheld, S., Valentine, V., Ritchie, B., and Druckenmiller, M. (2006) Updated estimates of glacier volume changes in the Western Chugach Mountains, Alaska, USA and a comparison of regional extrapolation methods. Journal of Geophysical Research, 111, F03019, doi: 10.1029/2005JF000436. Bahr, D.B., Dyurgerov, M., and Meier, M.F. (2009) Sea-level rise from glaciers and ice caps: A lower bound. Geophysical Research Letters, 36, doi: 10.1029/2008GL036309. Burgess, E.W., Forster, R.R., Larsen, C.F., and Braun, M. (2012) Surge dynamics on Bering Glacier, Alaska, in 2008–2011. The Cryosphere, 6, 1251–1262, doi: 10.5194/tc-6-1251-2012. Bush, A.B.G. (2007) Extra-tropical influences on the El Nino Southern Oscillation through the late Quaternary. Journal of Climate, 20, doi: 10.1175/JCLI4048.1. Clarke, G.K.C., Bush, A.B.G., and Bush, J.W.M. (2009) Freshwater discharge, sediment transport, and modeled climate impacts of the final drainage of glacial Lake Agassiz. Journal of Climate, 22, doi: 10.1175/2008JCLI2439.1. IPCC (2007) IPCC WG1 AR4 Report. Available at http://ipcc-wg1.ucar.edu/wg1/wg1-report.html [Intergovernmental Panel on Climate Change]. Lesh, M.E. and Ridgway, K.D. (2007) Geomorphic evidence of active transpressional deformation in the Tanana foreland basin, south-central Alaska, Tectonic Growth of a Collisional Continental Margin: Crustal Evolution of Southern Alaska (GSA Paper No. 431), Geological Society of America, Boulder, CO, doi: 10.1130/2007.2431(22). Muskett, R.R., Lingle, C.S., Tangborn, W.V., and Rabus, B.T. (2003) Multi-decadal elevation changes on Bagley Ice Valley and Malaspina Glacier, Alaska. Geophysical Research Letters, 30(16), 1857, doi: 10.1029/2003GL017707. Rasmussen, L. (2004) Altitude variation of glacier mass balance in Scandinavia. Geophysical Research Letters, 31, L13401, doi: 10.1029/2004GL020273. Raup, B., Kääbb, A., Kargel, J.S., Bishop, M.P., Hamilton, G., Lee, E., Paul, F., Rau, F., Soltesz, D., Khalsa, S.J.S. et al. 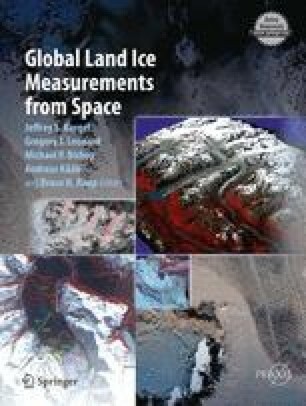 (2007) Remote sensing and GIS technology in the Global Land Ice Measurements from Space (GLIMS) Project. Computers and Geoscience, 33, 104–125, doi: 10.1016/j.cageo.2006.05.015. Sauber, J., Molnia, B., Carabajal, C., Luthcke, S., and Muskett, R. (2005) Ice elevation and surface change on the Malaspina Glacier, Alaska. Geophysical Research Letters, 32 (L23S01), doi: 10.1029/2005GL023943. Shugar, D.H., Rabus, B.T., Clague, J.J., and Capps, D.M. (2012) The response of Black Rapids Glacier, Alaska, to the Denali earthquake rock avalanches. Journal of Geophysical Research, 117, F01006, doi: 10.1029/2011JF002011. Tamisiea, M.E., Leuliette, E.W., Davis, J.L., and Mitrovica, J.X. (2005) Constraining hydrological and cryospheric mass flux in southeastern Alaska using space-based gravity measurements. Geophysical Research Letters, 32, L20501, doi: 10.1029/2005GL023961. Wiles, G.C., D’Arrigo, R.D., Villalba, R., Calkin, P.E., and Barclay, D.J. (2004) Century-scale solar variability and Alaskan temperature change over the past millennium. Geophysical Research Letters, 31(15), L15203, doi: 10.1029/2004GL00.